Neon announced the appointments of Tom Hulst and Gavin Hunter as Non-Executive Directors of Neon’s Bermuda operations with immediate effect. “Tom has over 20 years’ [re]insurance experience, having held senior positions with both US and Bermuda [re]insurers,” the company said. “He most recently served as Chief Executive of Ariel Re, overseeing a period of rapid growth and change for the company whilst driving strong financial performance. Prior to joining Ariel Re, Tom held various positions within the General Re Group. “Tom is a member of the Executive Committee of The Association of Bermuda International Companies [ABIC], which represents the interests of over 110 Bermuda-based companies and insurers. “Gavin brings over 30 years’ experience and a wealth of management expertise, most recently as Chairman and President of BenchStrength International, a specialist [re]insurance consulting company and prior to this as COO of Rebus Systems Inc., a North American software company specializing in insurance and reinsurance solutions. 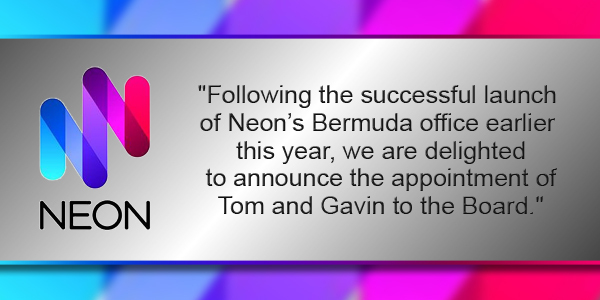 Martin Reith, Chief Executive Officer, Neon, commented, “Following the successful launch of Neon’s Bermuda office earlier this year, we are delighted to announce the appointment of Tom and Gavin to the Board.